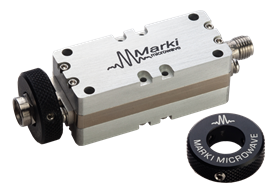 The unique Marki Microwave Connector Thumbwheel attaches to microwave and RF connectors of many different types including K, V, SMA, 2.92 mm, and 2.4 mm pin, allowing quick and secure connections between components and test equipment without the use of a torque wrench. It is secured with three included .050” hex set screws for a solid attachment to the connector. Recommended for easy connections on all microwave and RF test equipment.